Marcus chose an Agrison 75hp tractor to carry out multiple everyday tasks on his 100-acre property. With a wide variety of tasks to cover each day from plowing, rotary hoeing, mulching and weeding to land fill, tree removal and log splitting, Marcus was finding it difficult to manage with manual effort and very simple machinery. Seeking a 75 horsepower tractor with frontend loader and various attachments to accomplish his farming tasks, Marcus researched the market and found that the top brand tractors were beyond his budget. Looking for a more cost-effective tractor package solution, Marcus came across the Agrison 75 horsepower, which was retailing for around one-third of the price. Marcus directly contacted Agrison and visited their Campbellfield facility where he found a wide range of different models. 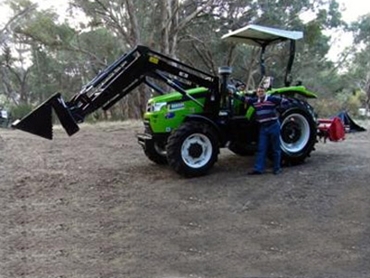 Marcus purchased the 75 horsepower tractor package and various implements including a log splitter and slasher. He explains that the Agrison brand is ideal for those who want a good robust tractor at a very fair price and are willing to do a little bit of home servicing and general maintenance themselves.